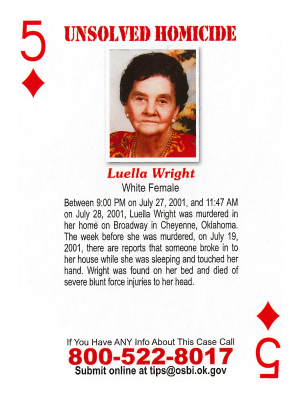 Between 9:00 PM on July 27, 2001 and 11:27:AM on July 28, 2001, Luella Wright was murdered in her home on Broadway in Cheyenne, Oklahoma. The week before she was murdered, on July 19, 2001, there are reports that someone broke in to her house while she was sleeping and touched her hand. Wright was found on her bed and died of severe blunt force injuries to her head.